L-R: Tonga Football Association technical director Kilifi Uele and General Secretary Lui Aho with the FIFA World Cup™ Trophy in Tonga. 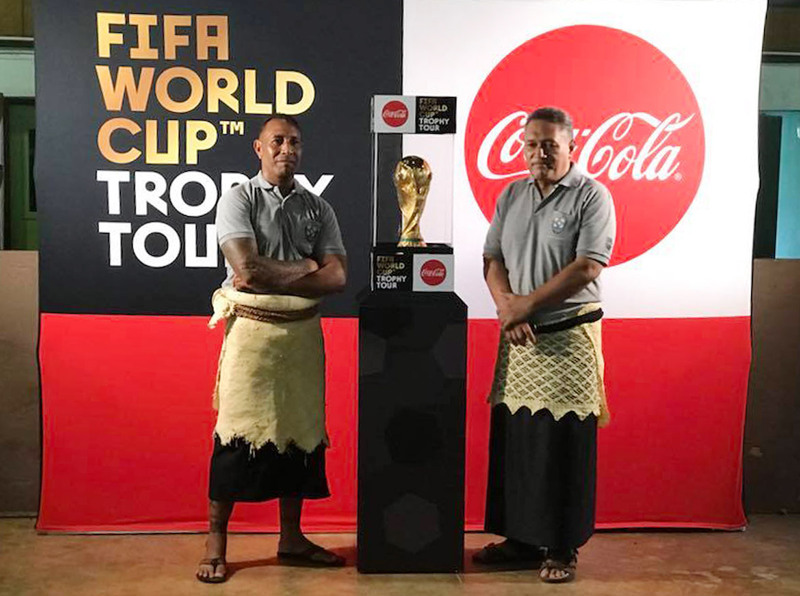 The FIFA World Cup™ Trophy Tour has landed in Oceania igniting early World Cup fever in the region. The first stop on the whirlwind tour of the Pacific was Tonga yesterday with former World Cup winner with France and New Caledonia legend Christian Karembeu on-hand to unveil the coveted trophy. The next stop on the FIFA World Cup™ Trophy Tour is the football-mad Solomon Islands with the final Oceania destination Papua New Guinea. Before starting on the global tour, the FIFA World Cup ™ Trophy Tour by Coca-Cola travelled across Russia for three months, spanning more than 16,000 kilometres and visting 16 cities, making it the longest host country tour in history.